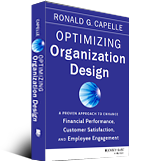 Capelle Associates specializes in helping executives to improve organization performance by optimizing organization design. We have specialized in this field for over 25 years. This gives you the broad and deep experience that is important to support you in successfully improving your organization’s performance. We have developed the Optimizing Organization Design® approach which is based on over 100 large scale projects and 24 research studies that we have completed over the past 25 years. We have developed assessment and implementation methods, materials and skills that are both comprehensive and cost efficient. This gives you a research based, client proven approach that can help you to optimize your organization design and achieve the related benefits. We have experience with virtually all types of organizations in the private, public and non profit sectors. Capelle Associates has experience with virtually all functions within organizations which include Marketing, Sales, Product Development, Operations, Supply Chain Management, Finance, Information Technology and Human Resources. We have broad geographic experience and have supported global clients with operations in North America, South America, Europe, Asia and Africa. We have worked with a range of organization sizes. Our assessments have ranged from under 100 employees to well over 16,000 employees. If you are looking for ways to improve your organization performance, we can provide you with significant added value. You get quality support from experts with the experience necessary to understand your organization’s unique challenges and opportunities. To request a discussion about optimizing your organization design, please call 416-236-3044 or fill out our online form. With the full benefit of hindsight I can only reiterate the statement I made to you following your final presentation, this is the best value for money I have ever experienced from any consultant.